The Tripp Lite SMART1500LCD UPS is a fantastic choice for any high-end computer system or small server. The best thing about the SMART1500LCD is the ability to either rackmount the UPS or stand it upright in a tower design. This much flexibility in a 1500VA UPS is hard to find. 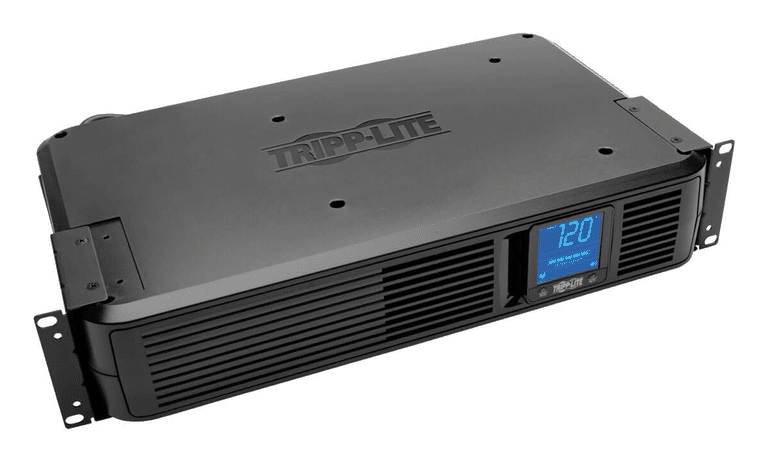 If you're a power user looking for an affordable rackmount UPS then you can stop shopping around - the Tripp Lite SMART1500LCD was made just for you. A newer, non-rackmount version of this battery backup is the SMART1500TLCD. Maximum output capacity on the SMART1500LCD UPS is 900 Watts. Unit features eight battery-connected outlets, providing backup for every attached device. SMART1500LCD can "cold start" meaning it can turn on without any input power. Battery charge takes around 5 hours but the UPS will probably come at least partially charged. The battery in the SMART1500LCD is pre-connected so setup is very easy. Bright, rotating LCD panel displays input voltage, battery capacity, and various other indicators. Rack mount hardware and USB cable are included with the SMART1500LCD UPS. Automatic Voltage Regulation (AVR) balances input voltage from 75V to 147V, helping to extend battery life. PowerAlert management software is available for free from Tripp Lite's website. This UPS weighs under 30 lbs, average for battery backup devices in this class. Tripp Lite's SMART1500LCD UPS is a superb choice if you're after a 1500VA battery backup. The SMART1500LCD might be a bit much for an economy PC but this excellent UPS from Tripp Lite is the perfect fit for anyone with a higher end computer, a business workstation or small server, or a media center PC. The standout feature of the SMART1500LCD, especially when compared to other 1500VA UPS offerings from Tripp Lite, is its rackmout and tower configurations. It uses only 2U in a rack and takes up very little floor or desktop space when configured as a tower. Don't underestimate flexibility of installation with a UPS - some can be notoriously hard to place around a computer system. Another thing we really like about the Tripp Lite SMART1500LCD UPS is the Automatic Voltage Regulator (AVR). Most UPS devices in this class also feature an AVR but the one in the SMART1500LCD compensates for a much wider range of low and high voltages. The more an AVR can be used to bring a high or low voltage back to 120V, the less the battery needs to be used. This ability ultimately translates into increased battery life, saving you money in the long term. The SMART1500LCD is configured to provide battery backup to all 8 outlets, a business-class feature. With eight outlets, you can give full backup and protection to more than just your PC and monitor. Many UPS devices provide surge protection to all connected devices but battery support to only a few outlets. I have a powerful PC with a large power supply, two LCD monitors, and various other standard components. With a full battery charge, my system was using less than 25% of the maximum supported output on the SMART1500LCD. That's over 30 minutes of runtime during a complete outage. The only thing I didn't like about Tripp Lite's SMART1500LCD was the lack of information available on the integrated LCD (not shown in the photo above). Input voltage is constantly updated but personally, I enjoy seeing an estimation of runtime remaining or at least a reading of the load that my equipment is putting on the UPS. Luckily this information is easily available via the free PowerAlert software available from Tripp Lite's website but I'd still prefer to see it on the LCD itself. Tripp Lite's SMART1500LCD is a great choice for high-performance computers, especially if you're looking for an affordably priced rackmount solution.